The mushroom takes center stage in Kennett Square, Pennsylvania, the Mushroom Capital of the World, for its 33rd Annual Mushroom Festival, September 8 and 9, 2018. 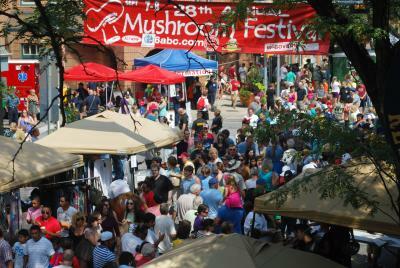 From food, to art, to music, to contests there’s mushrooms galore and a whole lot more! Add in the Community Parade with Dining and Dancing in the Streets and Old-Fashioned Carnival opening on Friday evening, September 7 and there’s a whole weekend of fun in Kennett Square. 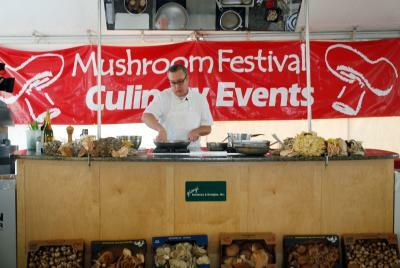 Opening the Festival on Saturday, Sept. 8 is the Amateur Mushroom Cook-Off in the Special Events Tent. This year’s theme: Mushrooms Blended with Grassfed Beef and Lamb. The stakes are high with a Grand Prize package worth over $3,000. Saturday also features the Antique and Classic Car Show with unique rides from across the region. The 33rd Annual Mushroom Festival welcomes Melissa d’Arabian, winner of Season 5 Food Network Star and host of Ten Dollar Dinners, to the Culinary Tent on Saturday at 1 and 3:15 pm. Our great local and regional chefs giving demonstrations in Barry Crumlich, PA Governor’s Executive Chef, Jennifer Daskevich, World Food Sandwich Champion, Nick Farrell, of Sovana Bistro, Mark Eastman of Chef’s Haven, and Eric Theiss, from QVC. At 3 pm on Saturday, it is the National Fried Mushroom Eating Championship in the Special Events Tent as contestants vie for this year&apos;s title of eating the most fried mushrooms in eight minutes. The World Record remains at 11.5 pounds, set in 2014. The contestant who devours the most of Buona Food&apos;s original fried breaded mushrooms in eight minutes will win a $1000 prize. The Amateur/Local Champion record was remains at 4 pounds, too. Will either of these records hold? Or will a new world and/or local champion be crowned? All are invited to cheer our contestants as they devour unbelievable amounts of crunchy mouth-watering fried breaded mushrooms. Once the Street Fair closes on Saturday evening, the Special Events Tent opens for a special concert featuring Alejandro Escovedo and Don Antonia – The Crossing Concert. Tickets, if still available, may be purchased through The Kennett Flash’s website. The concert is presented in partnership with Kennett Flash. Start your Sunday morning (September 9) at the Mushroom Run and Frances Ferranto Fun Walk. There’s a new course this year starting at Pennock Park on W. South Street. Registration opens at 7:30 am and the races kick-off at 8:30 am. This family inclusive event is fun for all! The Soup and Wine Event takes center stage in the Special Events Tent at 11 am on Sunday as guests vote for the best Mushroom Soup in the region and sample the area’s local wines. Mushroom Judging in the Growers’ Exhibit starts at noon and the mushrooms are sold starting about 1:30 pm. Festival favorite events returning for 2018 include the Growers’ Exhibit, cooking demonstrations in the Culinary Tent, Mushroom Soup at the Masonic Lodge, great acts on the Children’s Stage, the Cute-as-a-Button (Mushroom) Baby Photo Contest, live music on the Community Stage, and the Painted Mushroom Silent Auction. The Street Fair features nearly 250 vendors with lots of ways to enjoy mushrooms from mushroom soup to grilled portabellas, to wraps and ravioli, to mushroom ice cream. On the shopping side, there are mushroom-inspired sculptures, mushroom jewelry, clothing and more. 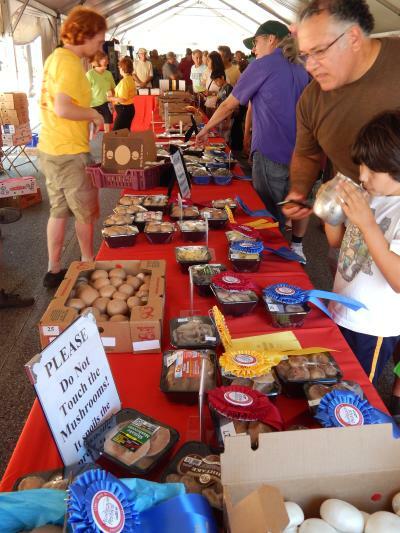 The Mushroom Festival is a great place to take home some of the freshest mushrooms around. Stop by the Mushroom Sales Tent and place your order any time then pick up your mushrooms from the refrigerated trucks near the exits on your way home. Admission is $3 for everyone 12 and up. All proceeds benefit local and regional non-profit organizations through the Mushroom Festival Grant program. This year we reach our $1 million milestone in giving back to the community since 2000. For 2018, local organizations received approximately $114,00 in grants to help our diverse community. Please note pets are not allowed at the Festival. Check out the official Mushroom Festival website at www.mushroomfestival.org for an up-to-date listing of everything that’s happening.